There is a tonne of information to talk about this week but I know you won’t have the time to read it so I’ll try and keep it short and sweet! This week as well as discussing how the Melbourne and Sydney property markets are faring I will also briefly chat about what I gleaned from my lunch with Bill Evans. For those of you wondering who Bill Evan is, he is Westpac’s Chief Economist since 1991 and has quietly made solid predictions on the Australian economy and its property market so worth a read! 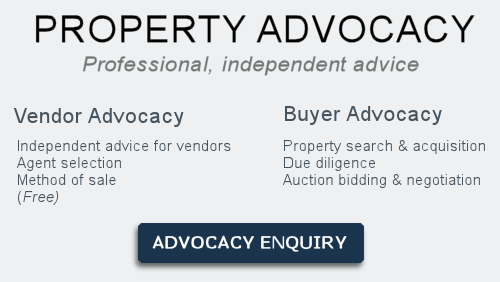 The REIV reported 1305 properties auctioned this weekend versus 1500 last week and 1475 for the same time last year. The clearance rate was 69% which is in-line with last week’s result of 70% and slightly less than the 76% recorded last year for the same time. Melbourne’s auction clearance rates are starting to see some consistent softening the past month, however this has been on the back of a record number of listings being auctioned the past few weeks. The previous week marked the last realistic opportunity for vendors to sell their homes before Christmas. Agents are booking mid-week and twilight auctions trying to compress as many properties on the market before Christmas but this will most likely lead to disaster for vendors. The trend for higher than usual pass-in auctions in the East continues with Doncaster, Bulleen and Balwyn showing considerable downturn. For those of you thinking we are witnessing a market collapse think again. In the past month we have tried to buy no less than 4 properties for our clients of which we have only been succesful in buying 1. On the flip side we have been succesful in selling four proeprties so looking at these results it appears the market still favours realistically priced vendors. This is a strong indicator and supports the theory that good property is still being inspected well and seeing strong competition. The properties we tried buyiung were in different areas, Middle Park, Brunswick and Malvern all different in type and condition bought well above our bidding estimate based on thorough research. So we are not seeing any bargains yet. 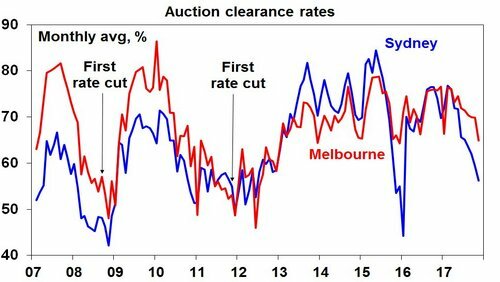 Looking at the Auction Clerance rates below, over the past decade Melbourne’s property market has seen some highs and lows however since 2013 the monthly average has remained steady moving between the mid 60 percent to the mid 70 percent range. The next year or two will indicate whether there the property market changes or not. The Reserve Bank of Australia has recently predicted strong economic growth (3%) in 2018-19, which in turn is expected to see wage growth and inflation. As a result of this more pessimistic view, interest rates are expected to remain on hold at least until 2019 according to Mr Evans. Banking Analysts Goldman Sachs have recently warned household will need to find an extra $42 billion of cash flow to fund mortgage costs due to higher interest rates for investors as more people are moved by their lenders into principal plus interest loans. Less disposable cash will reduce retail spending by consumers. Bill Evans predicts house prices will flat line, rather than crash, similar to the aftermath of bank interest rate adjustments in 2015. Australian Households are leveraged at record levels due to income growth. Retail and Construction jobs have been the two strongest contributors to employment growth in Australia and Victoria. Recent surveys have the Labour Party as the preferred party to win the next Federal election in 2019. Should Labour win property investors may see a raft of policy changes effecting tax which include the elimination of negative gearing and reduction of capital gains tax from 50% to 25%. Properties purchased prior to a specific date would be grandfathered. This in trun could see a rush to buy an investment property next year. But in future could also see investors turn away from property as an investment.